It was 1962, the story now continues…. After being owned by Great Britain for 300 years, this would be the year that Jamaica became an independent country. There would have been much Jamaican excitement about this upcoming August landmark. Mae Burkley (née Hodgson) of New York, had visited England the previous year 1961 but was now in her hometown Southfield, Jamaica. Whilst there she posed for a photo at Southfield’s Anglian church, Saint Mark’s. She stood alongside an old acquaintance Miss May Reid, who had been a founder member of Saint Mark’s Mother’s Union which had been established at the church since 1929. In fact, it had been Mae Burkley’s late grandmother – Gracie McIntosh – who had originally started up this sunday school institution. Mae Burkley & May Reid Stood By Saint Mak’s Church, Where Her Late Parents Mass Teddy & Mabel Had Married. “Near the steps at St Mark’s Church” Mae Sent This Photo To Her Brother Cecil In England. Marriage Of Clinton Roy Hodgson & Sheila Brotherton At Saint Phillip’s Church, West Bromwich. ‘Uncle Clinton & Aunt Cherry’ Married At Cecil And Helen’s Church. Leaving England, we now slip back to Jamaica…. Jamaica was not a wealthy country and had been sliding slowly into depression since the 1920’s. The years leading up to and after world War II in the 1940’s, accelerated the situation, which in turn caused riots and unrest on the island. Jamaican’s wanted change. Great Britain had owned Jamaica from 1655 – 1962. So after a period of more than 300 years being governed, Jamaica was about to gain it’s own self governance as an independent country. Queen Elizabeth’s sister, Princess Margaret and her husband Lord Snowdon arrived at Palisadoes Airport in Kingston Jamaica. She was to represent Queen Elizabeth for the changeover. The Royal party headed out twelve miles to Jamaica’s National Stadium where Princess Margaret she was to receive a royal box greeting. After some enjoyable entertainment by local Jamaican’s, the Jamaican National Anthem was then performed. At the National Stadium, the British Flag was ceremoniously lowered. Then just two minutes before midnight a new flag – a Jamaican flag – was ready to be hoisted. This ancient motto was in tribute to the unity of the original inhabitants of Jamaica, the Arawak and Tainio peoples, two different cultural tribes that had originally inhabited the island of Jamaica, when it was first discovered by Christopher Columbus in 1494. The old British coat of arms and motto were changed. Prior to Independence, the first ‘premier of Jamaica’ had been Norman Manley – the former solicitor who the Hodgson’s had previously hired to investigate the inheritance at Eccles House, Scotland. Jamaican Independence was here now and would begin with 78-year-old veteran Alexander Bustamante assuming the title of Prime Minister. He became the first ever independent Prime Minister of Jamaica. So 300 years of British control had come to an end. Jamaica was now a country in its own right, and now a member of the British Commonwealth. Queen Elizabeth II remained Queen of Jamaica – Head of State. Jamaica was self-governed now. The country built up strong ties with the United States of America. In October 1962, the United States discovered Soviet Union missile bases had been deployed in Cuba. It was very close to Jamaica. This major incident, historically known as ‘The Cuban Missile Crisis’ placed the world frightfully on the brink of global conflict. War though was thankfully averted. That ‘Cold War’ period involving the United States and the Soviet Union (Russia) in the 1960’s, strongly influenced Jamaica’s relationship and connection with the United States. The United States later became a primary investor in Jamaican tourism and took up mining in Jamaica, extracting the lucrative commodity, Bauxite (Aluminium) from Jamaica’s soil. “To Uncle Cecil From Myrtle” She sent this To Cecil In England. American citizen, Linton Hodgson’s daughter, Myrtle Millicent Hodgson, had remained in Jamaica and would have witnessed the countries move to independence. From Jamaica she would often send letters to her Uncle, Cecil Hodgson, asking him all about England. Myrtle had married a Jamaican man, James Brassington Williams. A son and daughter were born to them near the outskirts of Southfield, before Myrtle’s husband migrated to Oxfordshire, England. In March 2018, this year, I emailed one of those children, my cousin, Juanita Williams of Oxford – daughter of the late Myrtle Williams née Hodgson – hoping to learn more about her mothers emigration into England. Do you know what date your mother emigrated to England? Did she fly or sail etc etc. Mum flew in November 1962… with Manvill and me. I think it was one of the coldest winters in the UK on record if I remember rightly. So in the November of 1962 – just four months after Jamaica’s independence – Myrtle left Jamaica and emigrated to England with her young son and daughter, joining her Jamaican husband, James Brassington Williams, who had settled in Oxford. Their third and last child, a son, was born at Oxford. Myrtle became the only female Hodgson of the ‘Southfield branch’ that emigrated to England. She became an ‘Oxford Hodgson’ and would reside in that city for the rest of her life. It’s been a long time since I last wrote! 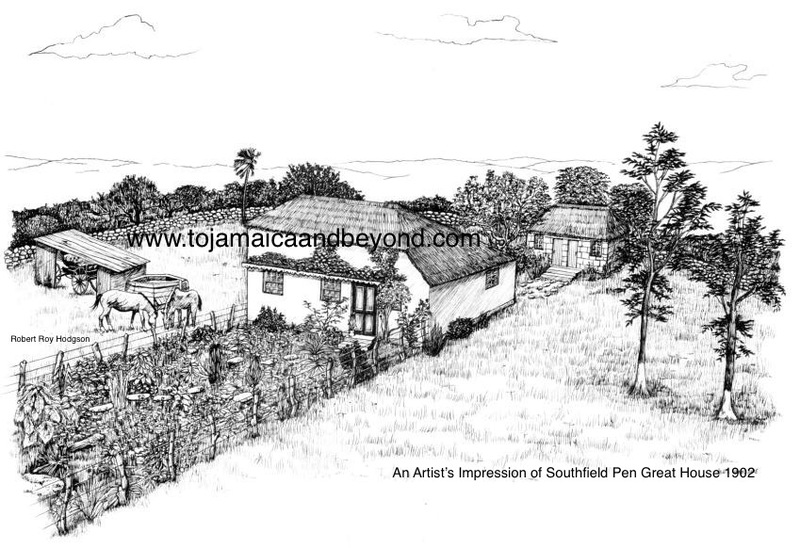 I have now covered the first section of my blog, ‘To Jamaica and Beyond’ 1939 – 1962. As we progress there may well be updates to some of those blogs that have already been written. All the old family photograph’s from this blog were found in Cecil Hodgson’s two photo albums at Southfield in 2004. They inspired me to research. Uncle Cecil didn’t know that he would be leaving behind a pictorial history of the Southfield Hodgson’s. It has been brilliant investigating his albums. I consider myself very fortunate to have found his collection, 5,000 miles away. If I had gone to Southfield just one month later, those photographs would have been gone forever, lost. All will be explained at a later date. Learning about Mae’s life and seeing her photographs makes me realise just how much she travelled. Looking at that small Polaroid photograph when she was at Southfield, tells a good story. It tells how much she loved her homeland. I was once told by one of Mae’s American grandchildren “She was always a Jamaican” You can see that in the photo. The photo of Uncle Clinton & ‘Aunt Cherry’ takes me back. I remember dad taking us to visit their home as a small boy and seeing my four cousins there. I remember Uncle Clinton cutting my hair. Memories of ‘Aunt Cherry’ who was taken away so very young. The group photograph of the Hodgson’s standing on the pavement outside Cecil’s house is yet another one of my favourite ones. Love it. Myrtle left behind an Oxford branch of Hodgson’s. I didn’t even know of her existence until I started researching our family history. I’m quite certain that if she had come to England as a single woman, then she would almost certainly have settled in West Bromwich at her uncle Cecil’s. I only met Myrtle once, but she wrote to me and we often spoke by telephone. I went to her funeral in Oxford. I decided that 1962 would be the perfect year to end the first section of my blog due to the ending of Britain’s 300 year rule in Jamaica. Now that you have an insight into how long Britain owned the island, it will be of interest to learn the historical and eventful story of Jamaica’s long past during those 300 years under British ownership. Much more will be written about this in future blogs. Robert Roy Hodgson.